Can diabetics eat bananas? Diabetics can eat bananas in very small amounts and preferably not every day. Because they have a high content of carbohydrates, a lot of which are sugars, bananas can easily be a source of side effects and raise blood sugar levels too much too fast, which is bad for diabetes. But when consumed in limited amounts infrequently, bananas can be good for diabetes because they provide good amounts of dietary fiber which tempers the absorption of sugar in the bloodstream, improves blood cholesterol profile and may help with insulin sensitivity. The fruit is also a source of potassium and magnesium, vitamins B6 and C which further contribute to healthy blood pressure numbers and wound healing, both important goals for diabetic patients. For a long time now diabetics have been advised to avoid the fruit because of its high carbohydrate content. This is because a lot of the carbohydrates in it (except for the fiber) are broken down into simple sugars during digestion and then absorbed quickly into the bloodstream, providing almost instant energy. This can cause a rapid rise in blood sugar levels and spark complications for diabetics, hence the recommendation to avoid the fruit altogether. But this may happen only if you eat too much at once, too often or don’t plan for the carbohydrate intake from the fruit and exceed you daily recommended intake for a diabetic. If you eat small amounts infrequently and enjoy an overall healthy, clean, varied and balanced diet suited to your individual nutritional requirements and the rigors of your condition, then you may eat bananas safely with diabetes. One of the reasons why bananas are considered one of those fruits to avoid with diabetes is because of their relatively high sugar content. The sugar in the fruit is processed quickly and absorbed into the bloodstream relatively fast, risking blood sugar spikes. Because of bananas effects on blood sugar, they are always best consumed in moderation and infrequently, so don’t eat eat them every day. It could help to choose less sweet varieties that are lower in sugar, but you still can’t eat very much at once, preferably no more than a small serving a day. All diabetics, whether they have diabetes type 2 or type 1, are better off eating foods on the lower end of the scale. The glycemic index of bananas varies between 42 (low) and 62 (high). The variation occurs with ripeness. The unripe fruit basically has more indigestible fiber, mostly resistant starches and a lower GI. In riper fruit, the resistant starch becomes sugar and the GI rises. 1) Bananas that are not fully ripe (relatively firm pulp, mostly yellow skin with some green, especially on the ends) have a glycemic index lower than 55. 2) Bananas that are extremely ripe (soft, almost mushy pulp, golden yellow skin with brown or black spots, sweet fermented, fruity smell) have a medium glycemic index, about 62. Studies show that diabetic patients, especially type 2 diabetes, may benefit from a healthy fiber intake. Fiber regulates digestion, prevents weight gain and helps with weight loss, regulates the absorption of cholesterol and other fats from food, contributing to benefits for metabolism and cardiovascular health. But remember that plant-based foods don’t have just fiber. When you eat a banana you get fiber, carbohydrates, sugar and other nutrients all grouped together in the fruit and you can’t choose which to eat and which not. So as the fiber accumulates, so do the sugar and carbohydrates. And this is why you can only eat small amounts of banana with diabetes. The riper the banana, the higher its sugar content and the more likely it is to negatively affect blood sugar, causing spikes (if you eat too much at once). As the fruit ripens, the resistant starches that account for its firmness slowly turn into sugar, resulting in a softer, sweeter pulp. The fruits that are entirely golden yellow or golden yellow with brown or black spots are the ripest and highest in sugar. The riper the banana the higher its glycemic index too, meaning it has the potential to cause a quick raise in blood sugar levels. The unripe fruit has a firmer pulp which signals the presence of resistant starch. Resistant starch works like indigestible plant material and adds to the fiber content of the fruit, lowering its glycemic index. What this means is that a less ripe banana is theoretically better for you if you have diabetes because they carbs and sugars in it will be absorbed slower into the bloodstream, resulting in more stable blood sugar levels. At the same time, it may be a source of possible side effects, especially stomach upset. See Are Unripe Bananas Bad for You? Red bananas are simply a variety of the fruit. They have a similar nutritional profile to yellow bananas. Also, the riper they are, the higher the sugar content and the glycemic index. The unriper they are, the higher the fiber content and the lower the glycemic index. Under no circumstances are banana chips good for diabetes. In addition to the natural sugars in the fruit, the chips also have plenty of added sugars or sugar syrups which makes them downright bad for you if you have diabetes. Moreover, as the fruit is dried and the water evaporates, the resulting product is more compact and holds a concentrated nutritional value. So 100 g of banana chips will have a lot more carbohydrates and sugar compared to the raw fruit. 100 g of banana chips have 58.4 g of carbohydrates, of which 35.34 are simple sugars and will cause blood sugar spikes. What further makes the dried chips bad for diabetes is the high fat content (33.6 g of fat) and high energetic value (519 kcal compared to only 89 kcal in the raw fruit). All of these will contribute to weight gain and complications such as cardiovascular problems. Are bananas a diabetes cure? 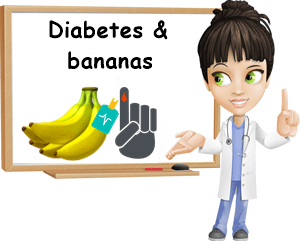 Bananas are not a cure for anything and do not hold any outstanding benefits specifically for diabetes. They are just a food like many others with both benefits and side effects, depending on how much you eat. Eating too much is definitely a cause for side effects, especially for diabetes, but a moderate intake that is suited to one’s individual nutritional requirements can provide mostly benefits, without the side effects. If you want to include the fruit in your diet safely, the best course of action is to have a medical professional determine your ideal daily nutritional requirements (sugar intake, total carbohydrates intake, fats intake and calories). Then simply measure serving sizes to determine how much carbs and other nutrients your food has so you don’t exceed your recommended intakes for the day. Do the same thing with bananas: calculate the nutrition in a serving and adjust your diet so you can eat small amounts occasionally without exceeding recommended intakes of sugar, total carbohydrates or calories. 1) Eat small servings. You can start off with half of a very small or small banana (40-50 g) or, even better, an amount your doctor recommends. 2) Don’t eat more than 1 small serving a day. 3) Don’t eat bananas every day. With diabetes, it’s best you alternate fruits to get a different and ultimately better nutrition. Not to mention many other fruits are much lower in sugar and have a low GI. 4) Avoid eating bananas on an empty stomach. It’s not good for diabetes, nor for the stomach. See Side Effects of Eating Bananas. 5) Ideally, eat a small serving of the fruit after a lean protein meal or a meal low in carbohydrates. 6) Don’t pair them with other fruits. Sugar and carbs accumulate from all sources. 7) Choose less sweet varieties (but still eat in very small amounts because they are still important sources of carbohydrates and sugar). 8) Remember that bananas effects on blood sugar will differ from person to person. Some diabetics may eat small amounts safely, others may be better off not eating them at all and choosing other fruits instead, such as low GI berries. See Can You Eat Cherries With Diabetes? 9) Count your carbs (and sugar) intake and plan ahead for when you want to eat fruit. If you feel sick after eating banana, it may mean you’ve eaten too much of it or too much carbs or sugars in general that day. Can You Eat Walnuts With Diabetes?